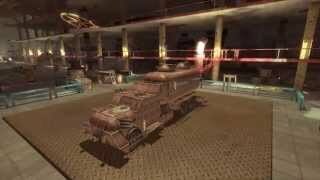 Steamcraft Game - browser shooter on cars with a steam engine. The game is made in the genre of steampunk. Plot tells of two inventors. In the last quarter of the 19th century, Englishman William Howard and his friend James Woutt drank in one of the eateries on the outskirts of the capital of Great Britain. The topic of conversation was interesting: a new invention of the time - steam engines. During the active discussion, they had an idea. It was that if you combine the cars with a steam engine with gladiator fights, then you get something interesting. It would also be interesting if someone creates a championship in these battles, which could eventually become international. And international tournaments are a way to make money, with the help of investors and a huge number of fans. And here, Howard has dawned, and why should they not themselves organize international tournaments among steam engines and offered their idea to a friend. He happily agreed. Has become the year 1881. Now William Howard and James Watt knew the whole world, because they were the main ones in the international steamcraft association. (Abbreviation - FISA). This group was known worldwide. It consisted of the organizers of the fighting, members of the panel of judges and traders details. The steamcraft championships have become very popular all over our planet. Almost in every major city was an arena, which were fought on steamcraft. The arena itself was much larger than the great amphitheater of the Colosseum. Such arenas were built, often on the outskirts of the city, or generally outside the city. The reason for this is the participants of the battles - cars with real weapons on board. 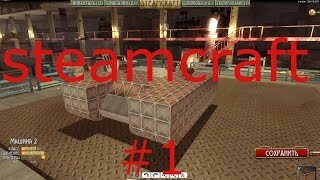 To become a champion in steamcraft, you need to beat every opponent. If you want to feel yourself in the role of a participant in this event, be sure to play iPlayer Steamcraft on our website. In the game you can build your own unique car that can fly or ride. If you do not want to create your car yourself, then you can buy a car in the store. In it, you can not only buy a finished car, but also buy certain parts. Also, you can sell unwanted auto parts to earn money, to buy the main weapon, or to paint your car. After registering, you will be able to begin dynamic and fast battles in a random arena. Choose any time of day, whether night or day. You can create your own team, which your friends will enter to unite in battles against your rivals. During the battle, disassemble the enemy into parts, you can discourage your opponent wheel, hood, or the main weapon. With the help of critical damage, there is an opportunity to finish off your opponent!
. Meet your enemies in steam engine machines now!